A happy New Year from Cameron and his cronies! Hands up all those Crips who know what's going to happen in 2013. Yes, you've got it, the Government are stopping Disability Living Allowance (DLA) and replacing it with a new benefit called Personal Independence Payment or PIP. This is the new system by the way that most disablity organisations claim is not fit for purpose and will leave some half a million disabled people without benefits after change over. You'll remember that the government pushed through these changes under the Welfare Reform Bill* which received royal assent and became an Act on 8th March 2012. In a nutshell the act abolishes DLA and replaces it with PIP. This is all part of the government's smoke and mirrors routine where they are trying to convince people that the financial sector is not responsible for creating the current crisis and are placing the 'blame' increasingly at the door of the poorest in society - those who need welfare support. Even the Department of Works and Pensions (DWP) agree that 500,000 current DLA claimants will not receive any PIP at all. They base this on their own figures that show only 1.7 million people between 16 to 64 will receive PIP. They state that, if there was no reform, the number of people getting DLA in the same age group would be about 2.2 million, which the country could not sustain. So, why are the Government pushing ahead with a replacement system that would appear to be even more flawed than the current one? And why are they ignoring all of the feedback that came as a result of a nationwide consultation process which recommended that they undertake a full equality Impact Assessment before pushing ahead with this new scheme? Oh yes, I forget, Cameron has just abolished Impact Assessments hasn’t he! Already ATOS and CAPITA, two of the big private sector organisations have been handed great chunks of the PIP assessment process and are rubbing their hands in delight at the prospect of yet more profit to be made at our expense. BTW by abolishing DLA and introducing PIP the Government has by sleight of hand removed 20 years of case law. All DLA Tribunal decisions are now just history! 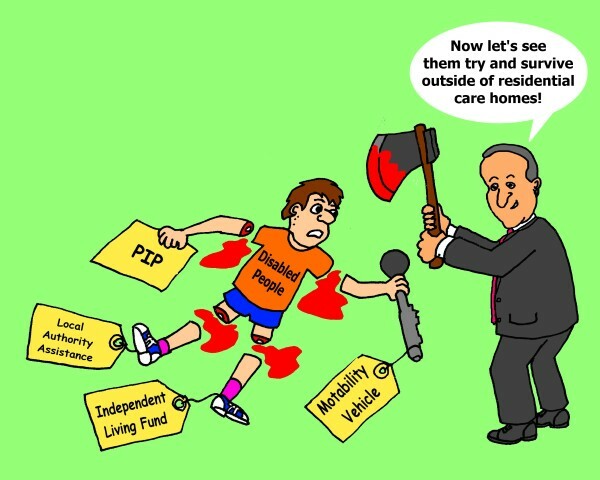 Welcome to Cameron's caring Big Society! * The Welfare Reform Act will not only be responsible for those disabled people not qualifying for PIP losing their 'passport' to other benefits and entitlements, but is also responsible for a large reduction in local authority funding (who are expected to provide a safety net for those people effected by benefit cuts). The Act also places a cap on housing benefit, ends legal aid for welfare and benefits issues and is closing down the Independent Living Fund (ILF) which many of us rely on in order to remain in the community. One of the main problems affecting many disabled people at the moment is a lack of income. And, as a result, a reduction in the ability to make those choices that affect the quality of our lives. Until recently, many disabled people earned a reasonable income from providing professional services to organisations which provided disability equality training for their workforce, as part of complying with their legal obligations in relation to employment and providing services. But recently this, and other equality training, seems to have slid right down to the bottom of the agenda - if not off the agenda completely. Crippen the cynic believes that this is all part and parcel of the present government's efforts to undermine our status as equal citizens in society. First, they labelled us all benefit scroungers and a burden on society. Then this gave them licence to go ahead with their cuts in support services, giving a bit of encouragement along the way to those charities that claim to represent disabled people. So this - among their many other evil acts - has resulted in a reduction in funding everywhere and signposts a one-way route into residential care for many of us. Many disabled people spent several decades wrestling disability action and equality training away from the "simulationists". Those were (and alas still are) largely non-disabled people, who think that making people wear a blindfold for 5 minutes enables trainees to understand what it is like to have a visual impairment or sending people out into the high street in a wheelchair shows trainees just how brave it is to tackle life on wheels. 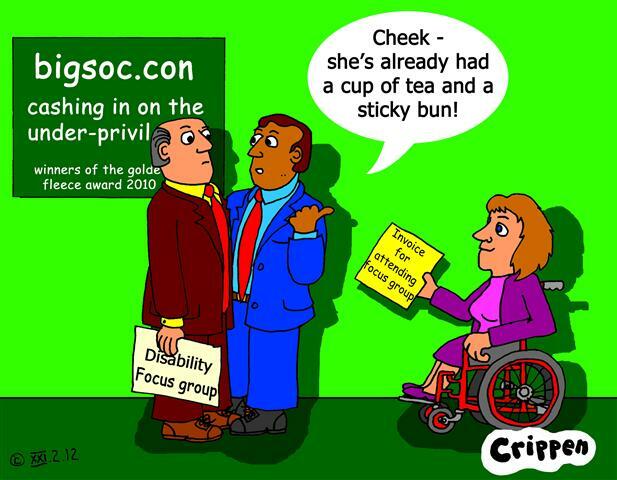 Having slogged to make disability equality training more meaningful, apparently now our skills are no longer recognised as valid or having any value. Apart, that is, in those organisations which seem to have revived the old tradition of inviting a disabled people to come in and talk about their own experiences, providing them with a cup of tea and a sticky bun for their trouble. So if you are one of those crips providing your services for free, could I just remind you that it took years of hard graft to establish our role as professional disabled people in the field of equality training. The last thing that we need is for our disabled brothers and sisters to undermine us in this role and to devalue the importance of this work. It also goes without saying that we need to earn a living and be in a position to fight against those right wing bigots who don't want us to have any part in their Big Society! "Thank you … I can only dream of being on the platform. One day … One day we’ll make it" (this was due to the fact that Liz was relegated as a disabled speaker to the area in front of the stage - the stage, as usual being inaccessible!). 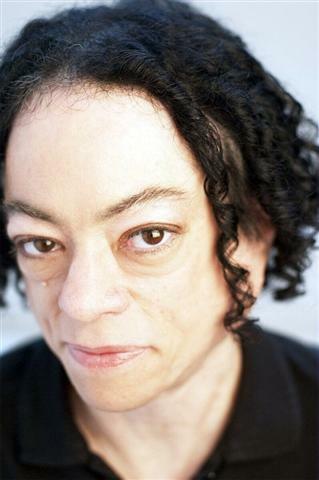 "Disabled people make up 20% of the population. That’s a conservative estimate. We are hidden impairments, we are visible, we are old, we are gay, we are lesbian, we are black, we are white, we are all sorts of people, that’s who we are. But what we are not is… We are not victims. We are not scroungers or frauds. We are not vulnerable or work shy. We are not charity cases or burdens or ‘unsustainables’ or useless eaters. We are fighters, survivors, leaders, comrades, brothers & sisters in arms, campaigners, citizens and equals. This, like for many of us, is not a new struggle. 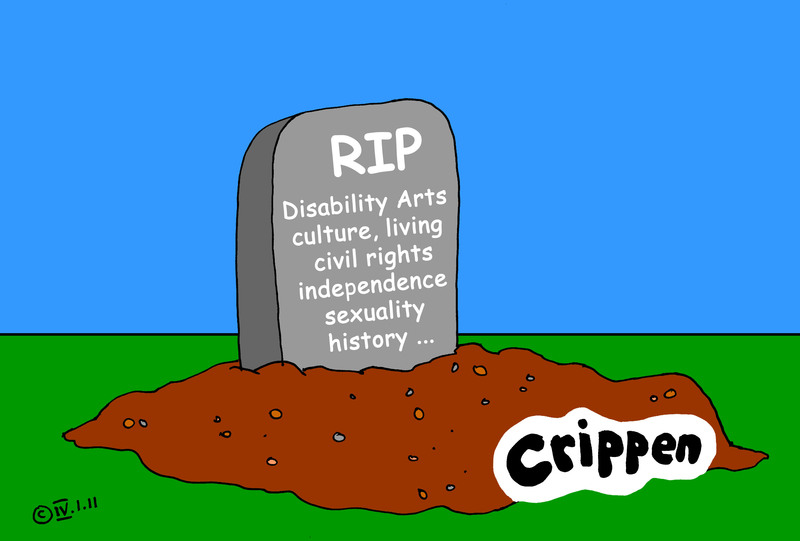 Our history is littered with disabled people being scapegoated, demonaised, discriminated against and oppressed. 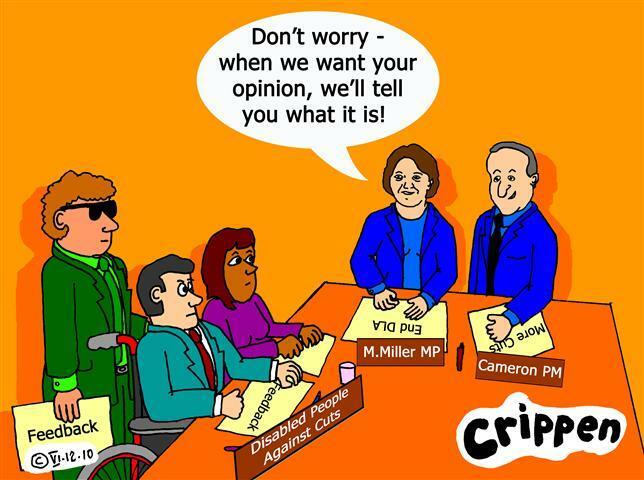 It is also a history of disabled people fighting back against this. From the League of the Blind who unionised in the 19th Century to fight for their rights, to the war veterans who marched on Whitehall for the jobs and respect they were due, to disabled people fighting to escape residential care in the ‘60’s and ‘70’s forming the Union of Physically Impaired Against Segregation, to those of us in the ‘80’s and ‘90’s who chained ourselves to buses to secure equality in public transport and in law … We have been here before. However, we are faced with a horrific onslaught of attacks from all directions. The cuts that we’re all talking about today, we encounter those cuts too – whether it’s the increase in VAT, privatization of our basic services, of the NHS, of cuts effecting the public sector – we experience them too as disabled people but on top of that we’re having our benefits whipped from us, we’re being assessed by ATOS. People in care homes are having the mobility component of their DLA (Disability Living Allowance) removed. We’re being charged for the basic right to have a wee, our Independent Living Fund money that allows us to be independent within the community is being removed in 4 years time, Incapacity Benefit is being scrapped and replaced by the unforgiving ESA (Employment Support Allowance), on top of that there is hate crime, limits to housing benefit, Access to Work, to transport and if we want to challenge it, to Legal Aid too. That’s fucked as well. Disabled people are living in fear. We are living in poverty. We are going to be living in the Dark Ages where they decide between the deserving and the undeserving poor. But, we will not let this happen. Because through our history, what we have learnt is that the media, the policy makers and the Government will try to separate us into our different groups. They will try to weaken us. They will try and make us compete against each other for whatever crumbs are on offer, fighting amongst ourselves, individualizing this struggle, dividing us so that they may conquer and change the balance of society in favour of financial capital rather than social capital and equality. That’s what happening. We cannot afford to let this happen. We are fighting for our lives, for our freedom, for our existence. That’s how important it is to disabled people and for everybody here today. It is about our basic liberty, our basic right to life. We will not be hidden away. We will not be hidden away behind close doors, out of sight out of mind, in our homes or institutions. We will not settle for charity rather than rights. We will not be forgotten. We will not be silenced. We must mobilise and in doing so not forget those who cannot take to the streets in protest but who can through virtual protesting. We must politicise. We must educate ourselves and others in what’s happening in our own and wider campaigns. We have to radicalise. This is about revolution not reformation anymore. We must unite. As disabled people, as disabled people and allies, as everyone - we must unite. Together we are stronger. Thank you." Crippen says 2011 - bring it on! here's hoping that you had a great holiday and are all fighting fit for 2011?! I'm just getting over man flu (second dose) so have been a bit lax with regard to posting here for a couple of weeks. I am, however putting the final stages to the follow-on from my last blog where lots of you mailed and messaged me with ideas and suggestion about involving the disability arts movement with the current anti-cuts protests throughout the UK. I hope to have this up within the next couple of days. It will be well worth waiting for, I promise. As I've previously mentioned. I'm now running a seperate blog to carry my more political work and you can see what I'm up to there by clicking on the following link. It's a scary time as this government are gradually clicking all of the pieces of their 'Big Society' into place, and the recent white paper intended to change the way that people give to charities in the UK is a part of this. This will affect all aspects of disabled people's lives and is part of the bigger plan to get us off the streets and back into Care Homes! The following letter was received by Caroline Lucas MP (Green Partry - Brighton Pavilion) when she wrote to the Minister of Disabled People on behalf of one of her disabled constituents. From Maria Miller MP "Thank you for your letter of 19 November to the Secretary of State on behalf of a number of your constituents about the effects of the Comprehensive Spending Review on disabled people. I am replying as the Minister for Disabled People. As you know, the Coalition Government is absolutely committed to supporting disabled people, to improving the quality of life of those facing disadvantage, and to tackling poverty by addressing the causes driving it. The fiscal legacy we inherited has forced us to make some tough decisions about how we target our resources ' the Budget deficit is costing this country £43 billion a year in interest payments alone, and getting debt under control is critical in ensuring that we can put the country back onto the right track, and so safeguard the support we are able to provide to the most vulnerable in society in the future. Throughout the Spending Review process, HM Treasury has looked closely at the impact that decisions may have on different groups in society, and published a high-level overview of the impact of the Spending Review. and the current complex system of means tested working-age benefits and tax credits will be replaced with the Universal Credit, encouraging people to move into work. We are committed to simplifying the benefit system to ensure it is fair and supports disabled people in their day-to-day activities. To recognise the role of Disability Living Allowance it will not be included in the Universal Credit. A full summary of the changes that affect disabled people has been published on this Department's website at www.dwp.gov.uk/adviser/updates/spending-review-2OIO, where people are able to register for updates to help keep them fully informed. Theresa May, the Minister for Women and Equalities, and I wrote to Ministers across Government in advance of the Spending Review to remind colleagues of the need to consider the impact of policy and financial decisions on different groups of people. Within this Department, all Budget and Spending Review measures will be equality impact assessed. Where the detail of policies is still being developed, we will publish Equality Impact Assessments at the most appropriate time, for example alongside the Welfare Reform Bill or to accompany the Uprating Order. Some policies, such as changes to the Disability Living Allowance assessment, will be subject to consultation and, therefore, the Equality Impact Assessment will be published at a later date, when policies are finalised. The equality impacts of Budget changes have been published where detail of the policy has been finalised, and can be found on this Department's website. I believe it is key to work with disabled people, who can tell us about the overall effect of public policy and services on their lives, in order that this can inform how we develop our policy and strategy. The role of EQ2025, the Government's disability advisory group, is therefore invaluable I support a co-productive approach and 1 will continue to talk as widely as possible with disabled people about how we can make reforms that enable economic recovery, while ensuring that the impact on disabled people and other disadvantaged groups remains proportionate. With regard to the report mentioned by your constituents, "Destination Unknown", I have read the report with interest and have asked officials from the Office for Disability Issues to consider the findings. I plan to meet with Demos to discuss this further. 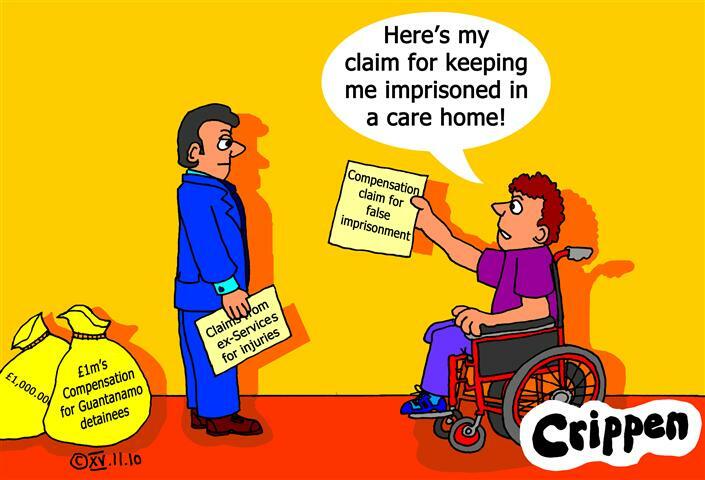 The proposed measure will end payment of the mobility component of Disability Living Allowance for all state funded residents in care homes after 28 days While these residents will not be paid Disability Living Allowance, they will retain an underlying entitlement so that when they leave the care home they will not need to re-apply for the benefit. Local authorities' contracts with care homes will cover services to meet a resident's assessed needs. These will cover activities of daily living, which may include providing access to doctors, dentists and local services such as libraries and banks. In addition, care homes should help residents pursue their individual religious beliefs. Our commitment to increasing the take up of personal budgets in Adult Social Care will give disabled people more choice and control over their care – including accessing transport that suits them. This measure will end the anomaly whereby two State funded residents with similar needs who are placed in the same care home can be treated differently according to whether they are funded through the NHS or local authority. This measure will not apply to residents who meet the full costs of the care home themselves and they will continue to be paid both the care and mobility components of Disability Living Allowance to which they are entitled. It is important that people who are capable of moving towards employment are not left to spend years on benefits. People in the Employment and Support Allowance Support Group, for whom work is not a viable option, will be unaffected by the change, as will those receiving income-related Employment and Support Allowance. After a year, those people who have no other means of supporting themselves will qualify for income-related benefits - there will always be a safety net for those who need it. We know that disabled people want the chance to compete in the labour market and over the course of this Parliament, we are investing very substantially in back to work support, including the new Work Choice programme, which is expected to support more disabled people into employment each year than any of its predecessor Government programmes. Funding for social care has never been ring fenced at local government level. Personal Social Services grants, which were previously un-ring fenced grants from the Department of Health to local government, have been increased by £l billion in real terms. They have now been rolled into the local government formula grant to help support social care, while giving local authorities maximum flexibility to use resources in a way that best meets local priorities. This is part of an additional £2 billion that the Spending Review allocated to support social care, which together with e programme of efficiency savings, will mean that local authorities need not restrict access to care. I do hope that this helps to reassure your constituents that the Coalition Government is fully committed to enabling disabled people to have the same opportunities and choices as non-disabled people. Parliamentary Under Secretary of State and Minister for Disabled People"
UK citizens who were detained illegally at the US run Guantanamo prison in Cuba are to be paid millions of pounds compensation by the British Government. And quite right to. Innocent people being locked away in an inhospitable place, away from their families and friends and all because they appear different to the rest of society should be compensated. For someone to be denied their place in society and to be incarcerated in a place not of their own choosing must be a terrible experience to undergo. Imagine being treated as though you were not safe enough to be let out into mainstream society. Imagine having your right to a decent education, to travel where you want and socialise where you want taken away from you. Being kept segregated from family and friends and having your Civil Rights abused in more ways than we could imagine. Thousands of Disabled people are being detained in this country under these very conditions. With no accessible alternative housing being made available to them, other than the care homes they currently reside in. Run and controlled by charities, many of these places are no further forward in their thinking than the work houses of the last century. Unless we fight for the rights of our Disabled brothers and sisters who are being detained in this way, we are as bad as those who lock people up and throw away the key. For more information you can contact the Direct Action Network (DAN) by clicking on this link.